ICPR organizes Periodical Lectures every year by different Colleges and Universities for the promotion of philosophy among the young students of different cities of India on a low cost budget. Senior scholars of the local area are requested to lecture to the young scholars and teachers, so as to enable them to be benefited by the lectures. 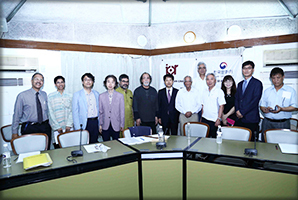 .With a view to acquaint Indian scholars with thoughts of contemporary leading philosophers as well as to provide opportunities for close interaction with them, the Council invites Indian and foreign scholars every year to deliver lectures. Under this scheme, the Visiting Professors deliver a series of three or more lectures in at least three different universities in India. The Council extends financial support to the universities for organizing such lectures and also bears travel and hospitality costs of the invited scholars. The universities are given a grant of Rs.35,000/- by the Council to invite the interested scholars from their region to attend the lectures and participate in the discussions. Besides making travel arrangements as well as providing local hospitality to the invited professors, the Council pays them a token honorarium of Rs.20,000.